56/68 Michael Bentley Julianne Moore cries and screams her way through a meager and cynical take on race relations. 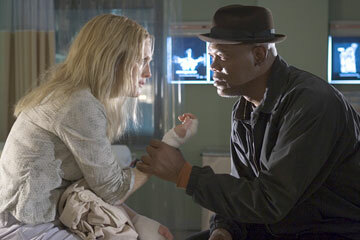 113/159 David Mumpower Pointless melodrama is amplified by Samuel L. Jackson's best performance in recent memory. Based on the bestselling novel by Richard Price (Clockers), Freedomland is a grim look at inner-city desolation in New Jersey. The story begins with Brenda Martin stumbling into an emergency room, bruised and bloodied from injuries. The woman says that she has been carjacked, and that the black man who stole her car managed to get away with her four-year-old son in the backseat. Lorenzo Council is a veteran detective assigned to the case, and believes Brenda's story may have some holes. Nonetheless, he begins an all-out search for the child. Even as he does so, an ambitious local newspaper reporter named Jesse Haus also has suspicions about the woman's story, and befriends Brenda in an effort to cover what might wind up being the biggest story of her career. Making matters extremely difficult, however, is the fact that as the search for the carjacker grows ever more intense, racial tensions between two cities, one predominantly black, the other primarily white, threaten to explode into violence. See the latest developments for this project on the Freedomland Movie News page.